What is AND Gate? Definition and Explanation With Diagrams. Digital Electronics is an important subject of Electronics as everything is going to be digital. So we should study it carefully if we want to be good in Electronics and want to be a good engineer of Future. The logic gates are so important in Digital Electronics. Today we are going to know about AND Gate. NAND gate do multiply or product of two given inputs(But in Boolean algebra we can't call it multiply or product). It produces high output that is 1 only then, when all inputs are high or 1. It gives low or zero output when any one of inputs are low, zero or off. These high or low outputs are called Logic states. 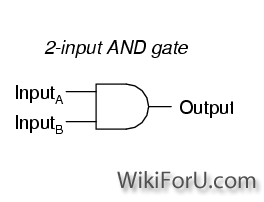 Thus an AND gate gives logic high or 1, when all its inputs are high or 1 and it gives Logic low state or zero when any one of its inputs is low or 0. When both Inputs are low, then AND gate gives zero or low at output. When A is low and B is high i.e. When one of the inputs is high, then it also gives zero at output. When A is high or one and B is low or zero, then it again gives zero at output. And in last case, when both the Inputs A and B are high(or one), And gate gives high, ON or one at output. 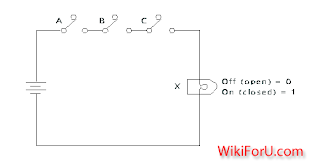 Now we are going to learn about the operation of AND gate that is How it gives On or Off at output. 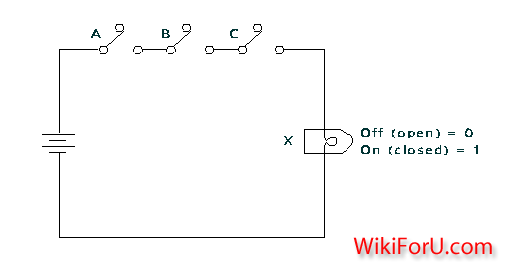 The following block diagram shows a simple circuit of AND gate. Three switch keys-A,B and C are inputs. In the left we have connected the battery and in right side bubble named X is a AND gate's output (LED). Open switch is referred to low, off or zero and closed switch key is referred as high, On or One. When the LED is glowing, It is showing High, On state or one and when LED is not glowing, it is showing low, off state or zero. The LED will glow only when these all three inputs i.e. switches are closed. If any one of them is open then LED doesn't glow and thus represents low or off state or zero. Some students often do mistake in speaking this type of equations that is they call it as X is equal to A multiply by B. It doesn't mean so. The above dot doesn't shows the operation of multiplication, It simply tells us that output X will be high or one when A and B both are in ON or high state. And we can speak it as X is equal to A and B.